I wasn’t quite sure what to make of this, a Lithuanian band who played at the HRH Prog weekend in North Wales and were recommended by a friend as one of the better live acts. 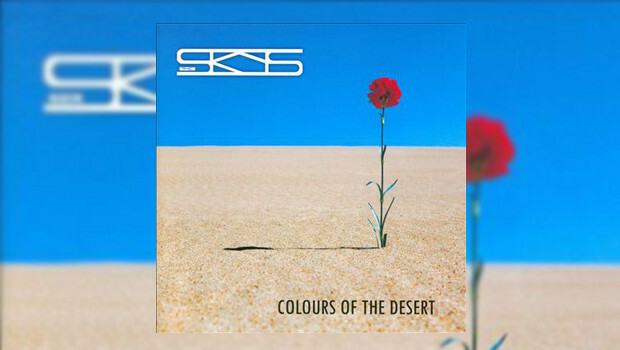 So, released in 2011 if the booklet is correct, Colours of the Desert owes a lot to the band’s influences but manages to do so and still on the whole sound fresh. The norm seems to be Genesis, Yes and occasionally Rush references, but not this time, the David Gilmour variant of Pink Floyd and Jefferson Airplane make up the bulk of the tracks here with a little Yes like styling and the odd trip into the more commercial realm of rock music. Despite the Pink Airplane, Jefferson Floyd stylings, I find this quite original. It grows on you. Yes there are a few “sounds like” riffs, but if you love something it is bound to rub off on the music you create. I can also see why this band would work well live, it has instant gratification, a few growers and some class in the delivery. Jonas Curlionis provides strong male vocals (and not a Gilmour/Waters copy) and Božena Buinicka equally strong female lead and counterpoint even manages to sound a little like Jon Anderson on occasions. There is guitar from Aleksandr Liutvinskij and solid bas from Justinas Tamaševičius. The guests have a very credible pedigree as well, Dave Kilminster (Roger Waters’ band and currently working with Dave Kerzner & Heather Findlay’s Mantra Vega project, one I am looking forward to hearing), drums from Martin “Frosty” Beadle (Lifesigns, Cutting Crew), Snake Davis (Eurythmics) providing some beautiful sax that just adds to that Floydian feel, Anne Marie Helder (Mostly Autumn, Panic Room) and Tony Spada (Holding Pattern). My biggest struggle has been Calling Your Name, starts very sixties mode, changes tempo, grows in its second half and finishes like a good pub meal, enjoyed, sated, but not quite the pizazz to make it exceptional. But it does grow on you. It is just a contrast from the other tracks. It just takes more listens to appreciate it. I..He sees Bozena lead and the Anderson like vocals, actually a great little track, brief by comparison but breaks up the other tracks with something different. The Pyramid has Bozena on vocals again and this is where I get my Jefferson Airplane/Grace Slick kick with some acoustic guitar providing a bridge, building (well you would, it’s a pyramid! ), a couple of reprises, some great drumming and guitar solos. Lethal Kiss chances the pace again, with guest vocals from Anne Marie Helder, a really arm and nice track. The last track has that touch of commercialism again, Snake Davis providing some more sax and spiralling down to close the album. This album appeared in 2011, according to the sleeve notes; they appeared at HRH Prog this year, and to the best of my knowledge there is no recent output. This is a worthy introduction, I am happy for it to be part of my life, some of you I am sure would quite like it to be part of yours. The latest rumour mill says that they are currently recording in London, I could happily put up with some more of the same when they have finished recording.